Is a Kumquat a Fruit or Vegetable? How Big Does a Kumquat Tree Get? Kumquat trees are smaller than most citrus trees and can be grown indoors. They also can be grown outdoors as an ornamental in warmer regions of the United States. Each kumquat fruit contains up to five seeds that you can germinate at home. 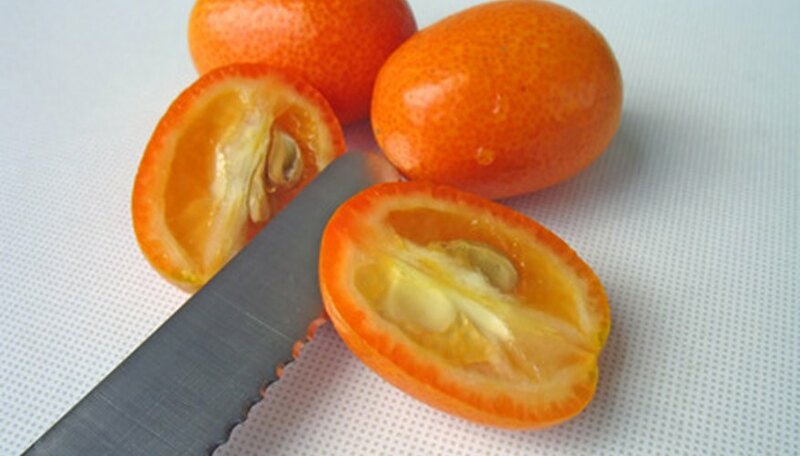 Cut open a kumquat fruit and remove the seeds. Mix equal amounts of potting soil and sand for a potting medium. Cut drinking cups to about 3 inches tall and punch holes in the bottom for drainage. Fill the cups with the planting medium. Plant the seeds while they are fresh and moist. Insert one seed approximately 1/2-inch deep in each cup. Cover the seed with potting medium. Water the seeds lightly. Place each cup in a medium-size resealable plastic bag to keep the seeds moist. Place the cups in the sun to encourage germination. Watch for growth in two to three weeks. Spray the seeds with water occasionally to keep the soil damp but not wet. Remove the plastic bags after the seeds have sprouted. Continue to water regularly. Transplant your seedlings once they have grown to several inches. Plant them in larger pots or fertile, prepared soil in your garden. Kumquats are small, 1 to 2 inch long, citrus fruits. They are similar in appearance to an orange, but have a leathery looking skin that is either orange or yellow. The outer skin is sweeter than its tart inside flesh, so some prefer eating the skin over the insides. Cut off suckers that grow along the trunk of your kumquat tree. These produce only vegetative growth and will never bear kumquats. If they're allowed to grow, they sap energy from healthy parts of the tree. Inspect your kumquat tree for dead, diseased or damaged branches. Container kumquats that are moved can be more prone to damaged branches during the moving process. Damaged or diseased wood appears blemished or distorted, while dead wood won't have leaves and will not move in the wind. Clip off dead and unhealthy wood at its base. In between cuts, sanitize your pruning shears by spraying them with disinfectant. This prevents you from accidentally spreading disease to healthy parts of the tree. Trim back long limbs to a lateral branch. Cut off any branches that crisscross other branches, since their rubbing will cause damage later on. Grow your kumquat tree in a sunny area. Although it will tolerate partial shade, make sure your tree gets at least 6 hours of sun a day. Unlike a citrus tree, the kumquat tree is cold weather-tolerant, and can withstand temperatures down to 28 degrees F.
Water the tree deeply every 10 days, watering more frequently during dry periods while the plant is blooming. Apply a micronutrient supplement, such as Organic BioLink, each spring. This should be applied to the leaves of the kumquat tree every month, from February to August. Prune your kumquat tree to remove dead or dying branches. When pruning, cut back to a large branch of the tree. Apply an insecticidal soap, as needed, to control mealy bug infestations. Prepare the container with soil before taking the seed from the kumquat. Mix 1 part potting soil with 1 part compost and fill the container to within 1 inch of the top. Cut open the kumquat to expose the seeds. Remove the seeds and rinse them with warm water. Place the seeds 1/2 inch deep in the soil immediately after rinsing. Don’t allow the seeds to dry out. Water until the soil is moist, then cover the container with plastic wrap. Place the container in a warm location where it will receive bright light. The seeds should germinate in three to four weeks. The soil should stay moist under the plastic, but if it starts to dry out, apply more water. Once the seeds germinate, place four Popsicle sticks around the outside of the container to hold the plastic wrap higher. Place the plastic wrap over the sticks and extend it down to the container. Leave the plastic covering on until the plants are 3 inches tall. Keep the plants in a cool, sunny location. Transplant them to a larger container each year until you have reached a 12-inch pot. If you live in a warm climate, you can transplant the tree into your landscape. A kumquat tree, a compact citrus variety, reaches a height of 8 to 15 feet. The trees grow slowly and produce a small yellow-orange colored fruit.